Water soluble - mixes easily into any delicious drink! Just add to shaker cup and go. Smooth, creamy texture that tastes great! Can also be stirred into yogurt, or hot cereal and is great for baking. Vanilla: Per 30 gram serving, HempPro 70 Vanilla contains 15 grams of protein and 2.6 grams of Omega 3 & 6. Chocolate: Per 30 gram serving, HempPro 70 Chocolate contains 14 grams of protein and 2 grams of Omega 3 & 6. 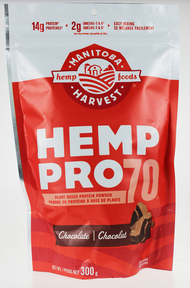 Manitoba Harvest HempPro 70 is the world’s first water soluble hemp protein powder ~ and now we've created it in a delicious flavour! This means that you can easily mix HempPro 70 in a shaker cup with any delicious drink of your choice. With 15 grams of protein per 30 gram serving, HempPro 70 Vanilla is a complete plant based protein, offering all essential amino acids - great for vegan or vegetarian diets. It is mild tasting with a creamy texture that is delicious when added to your favourite smoothie recipe, or stirred into yogurt or hot cereal. Shake with water or juice. Blend into smoothies, sprinkle onto hot cereal or yogurt. Recommended Serving Size: 4 Tablespoons (30g). Vanilla Ingredients: Hemp protein concentrate, organic coconut sugar, organic vanilla flavour, natural plant extracts. Chocolate Ingredients: Hemp protein concentrate, organic coconut sugar, organic fair trade cocoa powder, natural plant extracts. I started Manitoba Harvest with my friends Matin and Alex because hemp foods did wonders for me, and I wanted to share them with the world. In 1995, I was unhappy. At over 300lbs, I was unable to live the active, outdoor lifestyle I desperately wanted. Then, a friend introduced me to hemp foods. With omegas, digestible proteins, vitamins, minerals and fibers, hemp replenished much of what my body was missing. Before long, I had enough natural energy to climb a mountain…and a message to spread once I got there. Today, we’re proud to bring you Hemp Hearts, the very best and most nutritious part of the hemp seed, the heart. Try hemp – it could change your life! We've been carving a new path since 1998 and continue to look for better ways to measure success. That is why we are excited to have joined a leading global movement to redefine success in business. B Corporations (B Corps) are a new kind of company that uses the power of business to help solve social and environmental problems. Certified B Corps meet higher standards of social and environmental performance, transparency and accountability, inspiring all businesses to compete not only to be the best in the world, but to be the best for the world. Manitoba Harvest is tremendously proud to be a Certified B Corporation. Learn more and find out who else is a part of this elite community, by visiting http://www.bcorporation.net.